This guide is home to a few tutorials for basic skills that will be useful for patrons of VPL's Inspiration Lab. See your project libguide for information on what to bring with you to work on your project. Bring a USB Drive or have a Cloud Storage account that you can save to. If you are working on large digital video, audio, or high definition image projects, you may need a significant amount of storage space. When recording in the Inspiration Lab, it is important to give yourself enough time to save your work and exit the workstation 10 minutes before your booked time ends. Lab staff need time to prepare the space for the next booking. Allow time before the end of your booking for large file transfers. This may take 30 minutes or more. 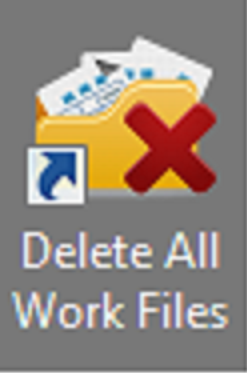 After saving your files on your USB (recommended), external hard drive, or cloud storage, and you are sure you have saved changes to your work, use the Delete All Work Files icon on the desktop to ensure that your files and personal information are deleted before the next person uses the computer station. To delete your files, click on the icon and confirm by clicking Yes. The Inspiration Lab is a place dedicated to learn and practice digital creativity, to collaborate and tell stories. It features high-performance computers, analog-to-digital conversion equipment, recording studios, self-publishing, and video and image-editing software. It's free with your library card! For doing these activities, some basic skills related to file saving, sharing, and troubleshooting are required. This guide is intended to cover some of the basic challenges that a new user may face when getting started. It goes over the basics of how to store projects, using both USB Drive and Cloud Storage options, and a glossary of common tech terms. The Inspiration Lab is a self-directed, Do-It-Yourself space in the library for creating and experimenting with digital media. Recording studios, equipment, and computers are available for booking if you have a library card with the Vancouver Public Library. To use the studios, you will need to have a library card with proof of address and no more than $10 in library fees. The Creation Stations and Digitization Stations can be used by anyone with a valid card, including an Internet Access card. The Inspiration Lab is open during regular Central library hours. However, the recording studios close half an hour before the rest of the library. Recording studios can be booked for a maximum time of three hours per day. Creation and digitization stations can be booked for three hour sessions, and time extensions are allowed depending on availability. Bookings of studios, creation and digitization stations can be made up to two weeks in advance. For more information about booking, please see the booking instructions for recording studios, creation and digitization stations. How Much Space is Needed for a Project? Recording songs or spoken word in the recording booths 600 MB per hour of audio It is best to archive audio with WAV, a lossless format. A WAV file is about 10 MB per minute. If you are recording a project with multiple tracks, each track adds to the size of the file. For example, if you are recording voice and guitar on separate tracks, as you have two tracks you would need to budget for two times 10 MB per minute, or 20 MB per minute. Filming video in the Terry McBride Recording Studio with the Black Magic Canon camera Close to 40GB per hour (600 MB per minute of footage) Although footage can be compressed in size afterwards, the raw footage can take up quite a bit of space. Also allow time to transfer your files if you use the Inspiration Lab camera. Scanning photos, slides, or negatives Depends on size and resolution A 4"x6" photo scanned at 300dpi and saved as a TIF would be about 6 MB. Digitizing an audio casette 600 MB per hour of audio It is best to archive audio with WAV, a lossless format. A WAV file is about 10 MB per minute. Digitizing a VHS tape 1 MB per second of footage Give yourself at least 4GB per hour of footage. If you plan to digitize a four hour tape, make sure you have at least 16GB of space on your storage device. If you are working on a eBook project, you will not need a great deal of space. Storage of a few GB will be more than enough. If you are working on an audio project (recording audio or digitizing cassette tapes), you could get by with a storage drive of a few GB, but at least 8 GB is better. If you are digitizing a VHS tape, give yourself at least 4GB per hour of footage. If you are recording footage with the Inspiration Lab's Black Magic Canon camera, allow at least 600 MB per minute. If you plan to record an hour of footage, you will need close to 40 GB of storage space if you want to save everything you film.